Picking peaches as a kid is one of my favorite memories. The warmth of the sun, walking along the peach trees, and picking my own fruit are all great parts of picking your own fruit. So, when peaches come into season I’m always looking for ways to incorporate more of the fruit into what I’m eating. Now, I love some peach cobbler and rustic peach pie but if I eat that every day I will surely end up in larger pants again. As I’ve mentioned, I’ve eaten so many salads that I get bored with them so I’m always looking for new ways to reinvent salad. 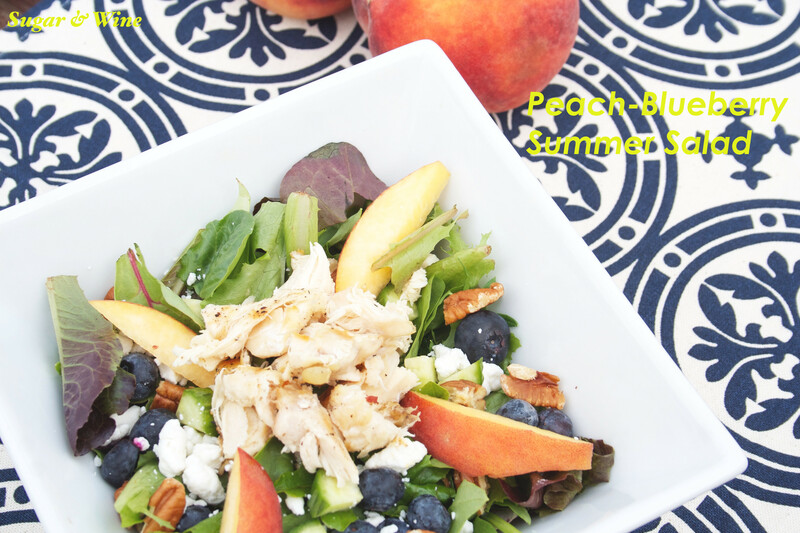 I’m kicking off peach season right with a Peach Blueberry Summer Salad. This salad is fresh and chalk full of fruits and veggies. If you are vegetarian or not feeling like meat, you can omit the chicken and still have a super tasteful salad. Start by cooking the chicken breast either on the grill or in a pan. The only seasoning I used was salt and pepper. Honestly, you could buy chicken from the store if cooking isn’t your thing or you don’t have time. While the chicken is cooking, cut and chop the veggies, fruits, and nuts and toss all of the ingredients in a bowl. Once the chicken and all of the ingredients are done, mix together lemon juice and olive oil. Enjoy!